You call those carved pumpkins on your doorstep Halloween decorations? Not so fast. Friends Steve Jandick and Nick Thomas have joined forces for the last 15 years to deck out Thomas' Illinois home with a slew of decorations and, more recently, a musical light display that shows how Halloween is really done. "It's a combination of two crazy people," Jandick told TODAY.com about the attraction. 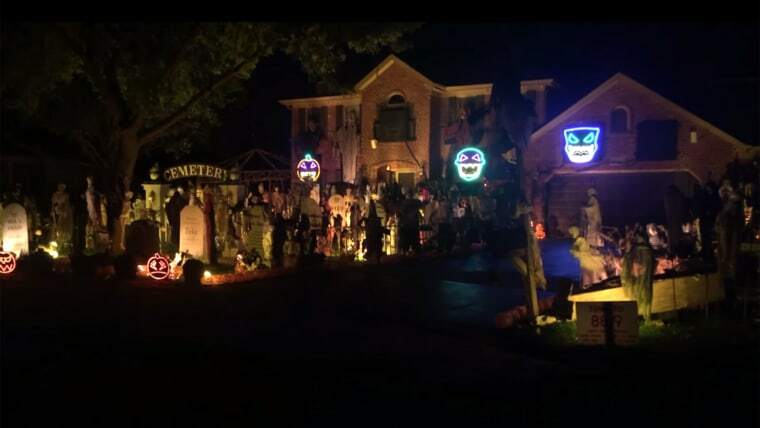 The home's over-the-top decor, which includes a lawn filled with statues and tombstones, is only topped by the Halloween lights that are sequenced to go along with 30 songs, including Lady Gaga's "Poker Face," Queen's "Bohemian Rhapsody," Michael Jackson's "Thriller" and more. The display is a team effort, Jandick said. Thomas takes care of the decorations while Jandick handles the light displays with some help from the animated light-show software Lightorama. The musical show runs on weekdays from dusk until 9:30 p.m., and on weekends until 10:30 p.m. Jandick said that last year, which was the first year they ran the lights with music, thousands of people showed up throughout October to take it all in. While most neighbors enjoy the festivities, Jandick mentioned that one family does take a vacation to Florida every Halloween. "There are one or two complainers, but mostly everyone's been fine with it," he said. Jandick grew up next to Thomas' home and has been helping create the display since 1999 — even making a point to come home during his college years to assist. Jandick now only lives 10 miles away and plans the setup with Thomas all year long. "I'm already picking out songs for next year," he said.